3 Was it a Rocket/Missile Strike? 8 How Many Scud Attacks and When? Was it a Rocket/Missile Strike? The missile was identified from its remains as a Scud-type rocket that government forces have increasingly used in areas under opposition control in the province of Aleppo and in the province of Deir a-Zor to the east, they said. Too much to digest at the moment. I'm not even sure how to start the page with a proper date. SOHR on Facebook was reporting it on Monday afternoon, my time, per Facebook. Everyone else puts it on Tuesday, the 19th. Aleppo province: 8 civilians, including a child, were killed by the bombardment on Jabal Badro, in the Tariq al-Bab neighbourhood of Aleppo. It is thought that the bombs were a surface-to-surface missile. the number of dead is likely to rise due to the large amount of casualties and that there are several people still under the rubble of destroyed buildings. An SOHR activist in the Tariq al-Bab neighbourhood witnessed the desperate cries of a man who had 15 of his family members under the rubble of their house; he also reported witnessing the body of a child being pulled out of a building, the head was detached from the body. 25 civilians, including 10 children and 5 women, were killed when a surface-to-surface missile fell on the Jabal Badro neighbourhood of Aleppo city, at midnight of Monday-Tuesday. Video: "Shelling on Jabal Pedro district in Aleppo during residents trys to pull out the wounded by Scud shelling"
video: "Injuries Due to A Scud Missile Landed in Jabal Bdour Neighborhood, Aleppo"
Abdeljabbar al-Akeidi, head of the rebel Aleppo Military Council in Syria's largest city and erstwhile commercial hub, was shown in video footage inspecting the scene. Syrian opposition fighters have captured several army bases in Aleppo in the last two months, depriving the army of secure sites from which troops have been firing artillery at rebel-held districts of the city and surrounding rural areas. A Scud missile slammed into a crowded slum in Syria's largest city overnight, killing at least 50 people and strewing body parts across the neighborhood, opposition activists said Tuesday. The missile [was] one of at least eight fired at the ravaged city of Aleppo by government forces since Friday, according to a U.S. official ... In Washington, the U.S. official told CNN that Syria has been launching Scuds about twice a day from outside Damascus toward Aleppo. The official could not confirm which Aleppo neighborhoods were hit, however. Forces loyal to Syrian President Bashar al-Assad started using surface-to-surface missiles against rebel fighters in December, after the rebels began using captured rockets to bring down government aircraft. SOHR Feb. 20: Aleppo province: Violent clashes took place this morning in the Saba' Bahrat neighbourhood and by the Neyrab military airport, both sides are using rockets and mortars, 1 rebel was killed in Saba' Bahrat, there are reports of further losses on both sides. The Aleppo neighbourhoods of Aqyoul and Qastal Harami were bombarded by regime forces' heavy artillery, several residents were injured. In Reef Aleppo the skies of Orum al-Kubra, Kafarnaha and Khan al-Asal witnessed fighter jets. Rebels from several factions are still surrounding the police academy in Khan al-Asal, they are continuously trying to storm it. The area around the Kweiris military airport , by al-Bab city, is witnessing bombardment from both rebels and regime forces; the rebels have been trying to take the airport for several months. Aleppo province: 4 rebels killed. 2 rebels killed by clashes in the al-Jarrah military airport, 1 rebel by the Aleppo international airport and the Neyrab military airport, 1 in al-Sfeira. 1 man was killed by wounds from the bombardment on the town of Tel'aran, by the city of al-Sfeira. In Aleppo city the Marjeh, Masaken Hanano and Karm al-Trab neighbourhoods were bombarded, clashes are taking place in the Bab al-Nasr and Saba' Bahrat neighbourhoods. A rocket fell on the city of al-Bab, no reports of losses. Rebels retreated from the military gas station (Sariyat al-Mahruqat) by the Neyrab military airport, after taking over it for a few hours today. Clashes took place by the police academy in the Khan al-Asal area of western Reef Aleppo, where rebels from several factions, including non-Syrian combatants, have been trying to storm for several months; they are using home-made rockets. 44 rats killed in Hanano when a SCUD missile landed on their headquarters. According to both Wael and our friend, Izzat (who finally contacted me), the missile was incredibly accurate. Civilian casualties are also reported, unfortunately, but without detail. Oweis has already been exposed as an agent for Qatar. Nothing he writes can be believed. He is also a sectarian liar. The photo is not of Aleppo. It's a file from Mosul, Iraq. We have not lost any bases but Taftanaz which was given up because it contained non-usable helicopters. What nonsense. Our army is crushing the JIhadist garbage sent by NATO and the apes of Arabia. Long live secular Syria. How Many Scud Attacks and When? "Syria's opposition and activists have accused the regime army of firing three powerful missiles at Aleppo city from military base 155 near Damascus on Friday. The Syrian Observatory for Human Rights says at least 58 people, among them 36 children, were killed when the surface-to-surface missiles struck the Tariq al-Bab district in eastern Aleppo city. The strikes triggered severe condemnation from Washington which described the incident as "the latest demonstrations of the Syrian regime's ruthlessness and its lack of compassion for the Syrian people it claims to represent". At least 141 people, half of them children, were killed when the Syrian military fired at least four missiles into the northern province of Aleppo last week, Human Rights Watch said Tuesday. A Human Rights Watch researcher who visited Aleppo last week to inspect the targeted sites, said up to 20 buildings were destroyed in each area hit by a missile. There were no signs of any military targets in the residential districts, located in rebel-held parts of Aleppo and its northern countryside, said Ole Solvang, the HRW's researcher. Human rights watch said 71 children were among the 141 people killed in the four missile strikes on three opposition-controlled neighborhoods in eastern Aleppo. 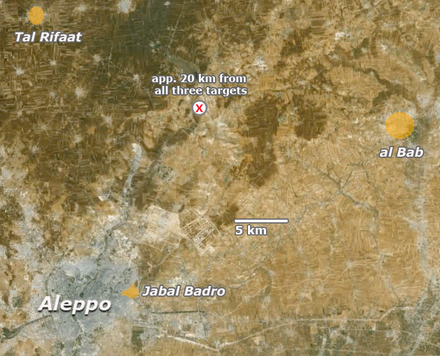 It listed the names of the targeted neighborhoods as Jabal Badro, Tariq al-Bab and Ard al-Hamra. The fourth strike documented by the group was in Tel Rifat, north of Aleppo. The regime "denies the use by Syrian forces of Scud missiles in battles against the armed opposition," Syrian Information Minister Omran al-Zohbi said in an interview with Arabic-language Russia Today. Washington Post, Feb. 26: "Ballistic missile strikes on Aleppo signal new escalation in Syria war"
Landing minutes and about a mile apart in two densely populated neighborhoods, they left scenes of devastation more closely resembling those of an earthquake, with homes pulverized beyond recognition, people torn to shreds in an instant and what had once been thriving communities reduced to mountains of rubble. Press TV, Feb. 26: "US Scud missile remarks aim to create new crisis for Syria: MP"
"Just when you think things can't get any worse, the Syrian government finds ways to escalate its killing tactics," Solvang said. This page was last edited on 28 February 2013, at 14:01.